To provide timely, accurate and meaningful financial information on the fiscal affairs of county government, provide ancillary support to the Commissioners Court, officials, department heads and the public with the highest level of professionalism, integrity with emphasis on financial accountability for the use of public funds while fulfilling statutory authority and responsibilities conferred on the County Auditor--by means of oversight, access, prescript measures and verification. 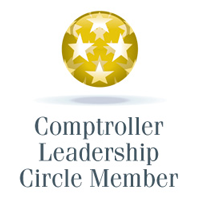 - To ensure effective and efficient administration of financial functions, which support the county auditor's office, elected officials, departments, and county government as a whole. The county auditor provides timely, accurate, and meaningful financial information on the fiscal affairs of county government, provide ancillary support to the Commissioners Court, officials, department heads and the public with the highest level of professionalism, integrity with emphasis on financial accountability for the use of public funds while fulfilling statutory authority and responsibilities conferred on the County Auditor by means of oversight, access, prescript measures and verification. The county auditor is located at 800 East Overland, Suite 406. 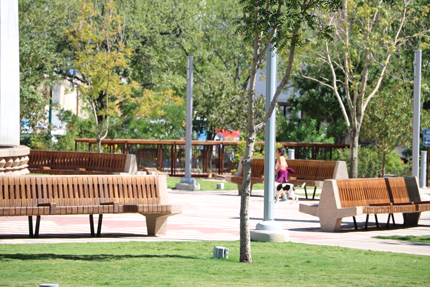 You can also contact the county auditor at (915)546-2040. Complete the Customer Service Survey so we can continue to improve service to our customers. We have engaged Ethical Advocate, an organization that specializes in advocating ethical culture and behavior, to work with us in developing systems and communication to achieve integrity, ethical behavior, openness, and the ability to quickly react to suggestions, feedback, and unethical behavior in our organization. 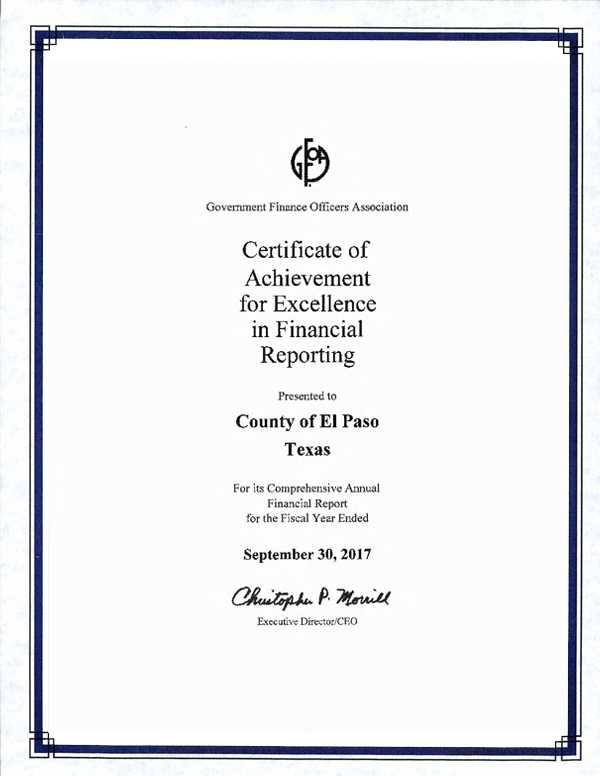 This distinguished award has been presented to the Auditor´s Office for the twenty-eighth consecutive year by the Government Finance Officers Association . 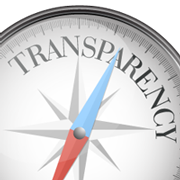 El Paso County is committed to providing transparency on financial information to the public. By doing so, it affords the public the opportunity to view and question how their taxpayer dollars are being spent. By displaying the county spending and providing access to those numbers we ensure greater accountability to the public. Procedures to Obtain Public Information. Texas Government Code, Chapter 552, gives you the right to access county financial records. All financial information is presumed to be available to the public. Certain exceptions may apply to the disclosure of the information. 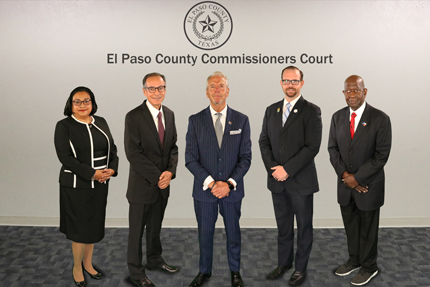 The El Paso County Auditor’s Office shall promptly release requested information that is not confidential by law, either constitutional, statutory, or by judicial decision, or information for which an exception to disclosure has not been sought. If a request cannot be produced within 10 business days, the County Auditor’s Office will notify the requestor in writing of the reasonable date and time when it will be available. Charges to the requestor: A person can ask to view the information, receive copies of the information or both. The County Auditor’s Office will assess copying and/or compiling fees based on the fee schedule set out by the State. If charges should occur, the County Auditor’s Office will send an itemized estimate and ask for a response in writing and/or payment within 10 business days, verifying that the requestor accepts, modifies, or denies the cost being charged. - Please label correspondence as Public Information Act request. - Include enough description and detail about the information requested to enable the County Auditor’s Office to accurately identify and locate the information requested. - Cooperate with the County Auditor’s Office to make reasonable efforts to clarify the type or amount of information requested.